JNN 08 Jan 2014 Abuja : A special event held by an Islamic organization in Akure city in south-western Nigeria has turned out successful after ten attendants reverted to Islam, making Shahada (declaration of faith) among joyous Muslims. “I was here yesterday listening to your sermon and that of the invited speakers. I have nothing to ask than to embrace Islam tonight,” Israel Kolawole, a Christian from Rock Immaculate Church of Christ, Akure, told attendants. Without any delay, he recited the shahada, taking the name Muhammad-Taofeeq. Kolawole was one of Akure citizens who had the chance to attend the special reception, held in honor of those who reverted to Islam recently during the program organized by Academy of Islamic Propagation ACADIP under the title “Akure for Islam-Phase7”. The event was attended by Prof. Bunyamin Alalaye, Lt Col Anthony Ojomo, former evangelist Kunle Olohunoje, Alhaji Alli Akewukewe, former evangelist, Peter Adebisi, Alhaji Alli Akewukewe, Dr. Ibrahim Joel and former pastor Chukwu Emeka Ohajimadu. The Chief Imam of Akure, Alhaji Abd Hakeem Akorede was a guest on this occasion. A very short Lecture was delivered by Yusuf Adepoju, a lecturer at Acadip, in which he established some contradictions and discrepancies from the Bible and allowed the audience to ask questions. After Kolawole recited the shahada, Seun Michael, a sister Christian from Christ Apostolic Church, Oke-Iye, Akure, also announced her intention to become a Muslim, declaring the shahada and taking the name Lateefat. They both were followed by two brother and six sisters, making the reception a historic one. 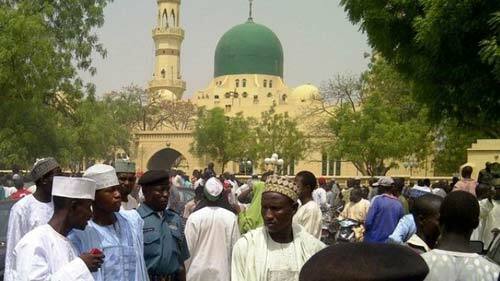 Last November, eighteen Igbo men from Nigeria’s mainly Christian southeast region embraced Islam at the National mosque Abuja, in Nigeria’s capital. A Christian monarch and then a daughter of a pastor had earlier this year reverted to Islam, the latter drawing widespread controversy over claims that she was hypnotized by a Muslim monarch in the country’s north central city Bida, Niger state. The Pastor’s daughter, Aisha, denied being hypnotized, insisting her choice of Islam was strictly a personal decision driven by conducts of Muslims around her. This entry was posted in Jafria and tagged Akure, Alhaji Alli Akewukewe, Israel Kolawole, Rock Immaculate Church of Christ, south-western Nigeria. Bookmark the permalink.